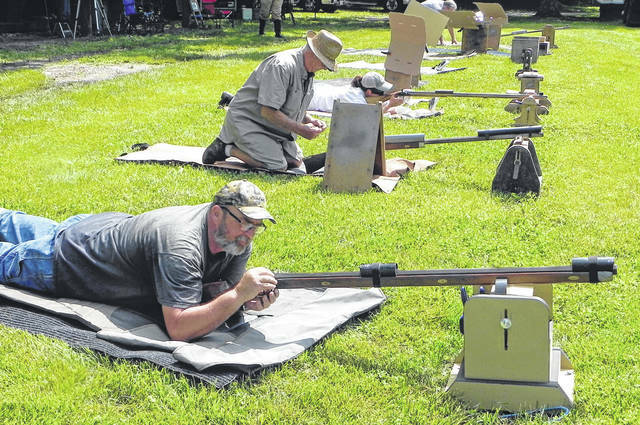 Photos by Larry S. Moore | Greene County News Blue Jacket Muzzleloader club members (front to back) Will Elliott, Roger Stratton an Dawn Swigart on the firing line preparing to fire. Gary Test of Jamestown carefully loads his chunk gun for the next round. The Blue Jacket Muzzleloaders Donnie Linkhart range. 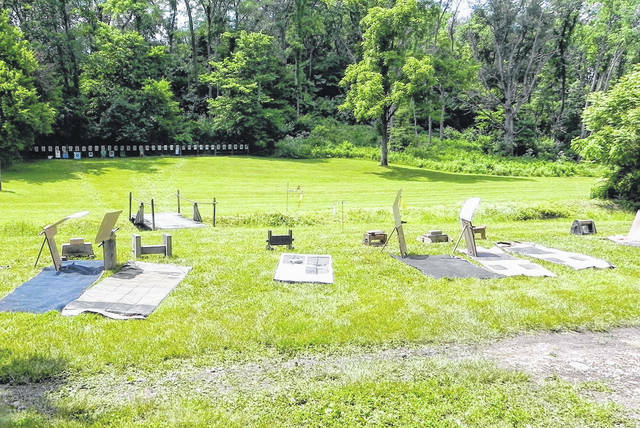 The dedicated group of black powder target shooters, with their unique target rifles, gather regularly on a Greene County farm. They are carrying on a tradition that began several decades earlier. They are the members of the Blue Jacket Muzzleloading Club. The tradition of their style of shooting, called chunk or over the log guns, traces its roots to frontier America. It is a very unique shooting experience still enjoyed across the eastern United States. This shoot was a special Donnie Linkhart Memorial Shoot, to honor his love of muzzle loading rifles and importance to the local club. It was started after Linkhart passed away following a battle with cancer. The club members also pay homage to a number of other black powder shooting enthusiasts who have also passed. 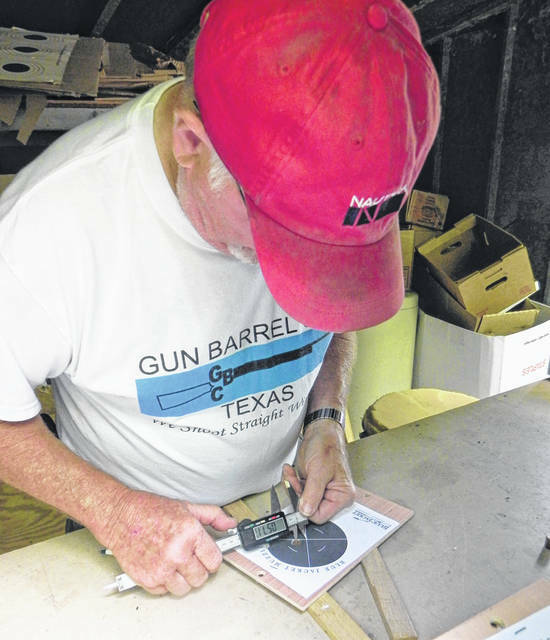 Butch Tobias, of Xenia, who is one of the founding members explains the club history, “The club was formed about thirty-years ago first under the name of Massie Creek Muzzleloaders. It was later changed to Blue Jacket Muzzleloaders. Linkhart provided the land for the range and did much of the work creating it. Following his death, the family has been gracious enough to permit us to continue to use the range. One of the earliest references for this type of shooting event is found in Sketches and Eccentricities of Col. David Crockett of West Tennessee, published in London in 1834. The author, James French, describes a Tennessee shooting match of 1831 involving Mr. Crockett. “Forty yards offhand, or sixty with a rest, is the distance generally chosen for a shooting match. If no distance be specified, this is implied. In all their shooting matches, no ball is allowed to count which is not found within an inch.” This type of frontier shooting has developed into the chunk guns of today. The name of chunk or over the log gun comes from the use of a chunk of wood or a log as a rest in the prone shooting position. The guns are very long barreled, typically 48-inches, black powder rifles, either in flintlock or percussion actions. The loads must be black powder with a patched round ball. Open sights are used and “shaders” to remove the glare of the sun from the sights are permitted. The most common guns are .45 and .50 caliber guns although others such as .32 or .36 caliber are sometimes seen. The roof over the loading area has to be high to accommodate the long rifle barrels and the ramrods required to load them from the muzzle. Competitors stand on stools in order to load the guns. It’s a combination of shooting event and simply friends enjoying themselves around the range. As with any shooting event, there are a number of tales told, some embellished by the teller about how well or, how poorly, someone shot on a particular day. Should a shooter screw up and shoot the wrong target, perhaps his neighbors target, it will be remembered and reminded for years! It is a close knit group of friends and shooters who keep the muzzleloading traditions alive It is great to see the members remembering and honoring those who participated before them. https://www.xeniagazette.com/wp-content/uploads/sites/32/2018/07/web1_DSCN8781NEW.jpgPhotos by Larry S. Moore | Greene County News Blue Jacket Muzzleloader club members (front to back) Will Elliott, Roger Stratton an Dawn Swigart on the firing line preparing to fire. 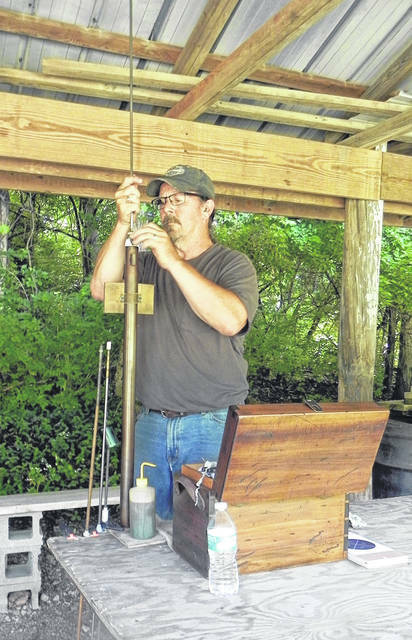 https://www.xeniagazette.com/wp-content/uploads/sites/32/2018/07/web1_DSCN8783NEW.jpgGary Test of Jamestown carefully loads his chunk gun for the next round. https://www.xeniagazette.com/wp-content/uploads/sites/32/2018/07/web1_DSCN8786NEW.jpgThe Blue Jacket Muzzleloaders Donnie Linkhart range. 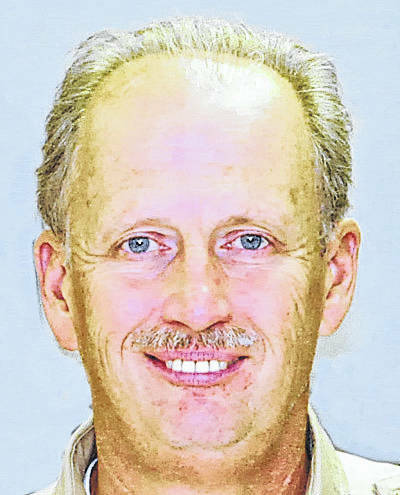 Larry S. Moore is a local resident and outdoor columnist.